"Top of the Mind with Julie Rose" on BYU - Baylor University Public Radio in Utah, January 13, 2019. Diane Levin Talks about TRUCE and Defending the Early Years on The Sunny Side of the Street on New-TV, August, 2017. "Local Early Childhood Educators Agree That Play Is Essential in Classrooms." TRUCE's Dr. Diane Levin delivers the keynote at the First Annual Preschool-Kindergarten Summit. Chicago Tribune/Winnetka Talk, Feb. 12, 2016. "Choosing Toys of Value," Chicago Tribune/Winnetka Talk, December, 2015. ​"Good Toys, Bad Toys: Student Help Pick High-Value Playthings for Annual Guide," Wheaton College News, November 18, 2015. 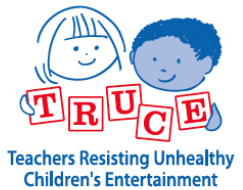 ​"TRUCE Family Play Plans: Encouraging Family Play in the Media Age," Child Care Information Exchange, May-June, 2015. ​"TV for Toddlers? It's Happening." Dr. Diane Levin is a guest expert on the radio program "On Point." April 1, 2015. (Diane's segment begins about 2/3 of the way through). ​"Family Play Plans," Boston Parents Paper, February 25, 2015. ​"35 Fun Ways to Beat the Summer Learning Loss," Parents Magazine blog, June, 2014.